Earth, Wind, Fire and Water. 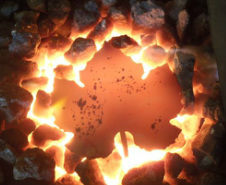 Each one of these elements are used when forging each handcrafted item. From accents for your home to functional pieces of iron art, Hobble Creek Forge prides itself on high quality, hand-forged ornamental iron work. Shane Hall, Blacksmith, uses traditional methods that have been used for thousands of years to create a product that will last and look like no other. By heating the metal to almost 2000 degrees, he is able to move the metal from its original form to a hammered work of art and beauty. You will find everything from simple household items to knives, cookware, railings, sculputres and much more. Our products make great gifts for those people that have everything. Our old mailing list crashed! ​Please sign up again to be notified of new classes and events. Thanks! Products made in the USA from 100% recycled steel.